In this text you can find the best Dark Rest tents for camping available on the market in 2019, all of them with features that reduce glare in the tent. This is a new trend in the family camping tents manufacturing. This is a new trend in camping tents manufacturing and only a limited number is currently available on the market in the US and much more in the UK. More about such tents you can see in my separate text. Here just to stress that this is about tents built from materials which can considerably reduce glare in a camping tent. As a result, you can sleep longer in the morning or you can sleep in the tent during the day, and the temperature in the tent is reduced to some extent. There are just a few brands currently building such dark rest or dark room tents. You will see their items below. Some use the term ‘dark rest tent’ like Ozark Trail, and some ‘dark room tent‘ and ‘blackout tents‘ like Coleman. Vango uses the term ‘lights out‘ to describe this design. But the meaning is the same, yet there are differences in the design and in the materials used. So do not get confused with the terms, I am using them all simultaneously. There are very different designs and sizes here, the tents are in the declared capacity range 3 – 10 people, and some of them are for all seasons. This is a completely unique design, a 4-season thermally insulated tent with the insulation R-value 4. I have included it in the list because of its thick insulation which creates a dark room inside. But this tent is far more than a dark rest tent. It also offers sound insulation and UV protection. 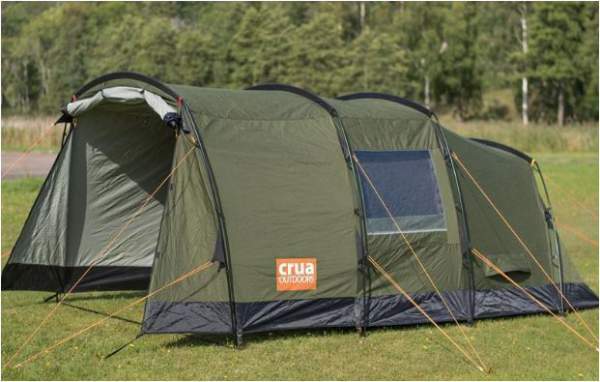 The Crua Tri 3 tent is built from breathable materials. So this is again something you don’t see frequently. This is a poly-canvas material, completely waterproof yet breathable. The inner tent is poly-cotton 65/35, and the outer shell material is laminated poly-cotton 80/20. The declared capacity is 3 people, but you indeed have 68.5 ft² (6.36 m²) of the total floor area which includes the inner tent with the cocoon insulated tent inside, plus the porch. So although the sleeping insulated area is relatively small, you have 19.5 ft² (1.8 m²) in the porch which also has a front vestibule. So you have plenty of space to store gear. 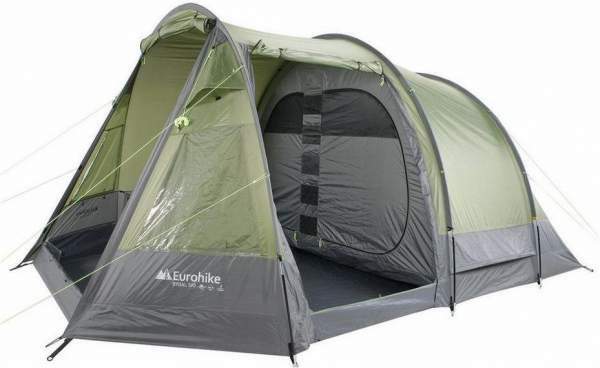 Note this is a top-notch tent for all seasons and the price is high, around $700 at the moment of writing this text. Ozark Trail 6-Person Dark Rest Instant Cabin Tent. This is the smallest in a new series by Ozark Trail, which already includes 4 tents, this tent and two 10-person tents (shown below), and one 12-person tent. So this is an instant cabin tent as you realize from the picture. Here again, the frame is pre-attached to the tent and the setup is incredibly easy. All materials are dark and the main features are in the roof. So here you have a 3-layer system with the fly outside, and below this is the inner tent with the mesh on the ceiling and underneath it, you have zippered dark panels. By closing and opening them as you find suitable, you regulate the amount of light in the tent. Note that the fly is with translucent vinyl windows positioned above those inner panels. Here you have 90 ft² (8.36 m²) of the floor area. The tent is presented in detail in my separate review, so please follow the link to see more. This tunnel-type tent is with the total area of 120.5 ft² (11.2 m²) for 5 people, so this is a luxurious option for family camping in any weather conditions in a 3-season use. This is because of its impressive waterproof rating of 4500 mm and the fully enclosed design. This implies solid PVC windows and fully sealed floor. In fact, the back sleeping area which contains two rooms separated by a divider is with double floor layer. The tent is loaded with great features. So you have UV guard technology, climate control, and blackout design. The latter implies that it blocks 99% of the daylight. Can you believe this? The living room is with 4 great windows and the full height door equipped with a mesh as a second layer. Please read more in my full review. 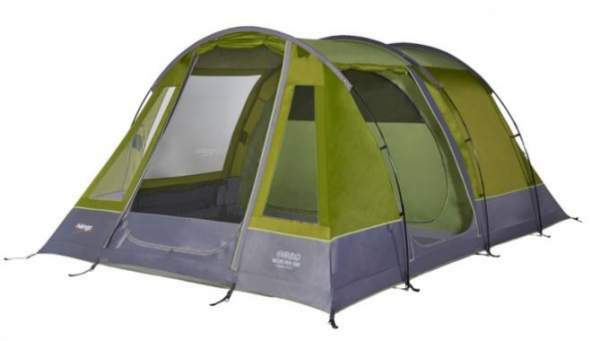 Coleman Carlsbad Fast Pitch 6-Person Dome Tent with Screen Room and Dark Room. From the title already you see what kind of tent this is. So this is an interesting design with several specific features. ♦ The main part of the tent is a dome structure and it is extended on one side with a screened room or screened porch. Note that the porch is without a floor, but you have a mat included in the package. So this is a space for sitting and cooking when the weather is fine. ♦ This is the fast pitch structure, and this means that the poles are pre-attached to the hub element on the top of the tent. ♦ Probably the most important feature is its Dark Room technology. They claim that it blocks 98% of sunlight and this makes the interior darker. They also claim that the heat is reduced by up to 11%. This all is mainly due to the fly which is of a particular material, but the rest of the tent’s fabric is also built in dark colors. 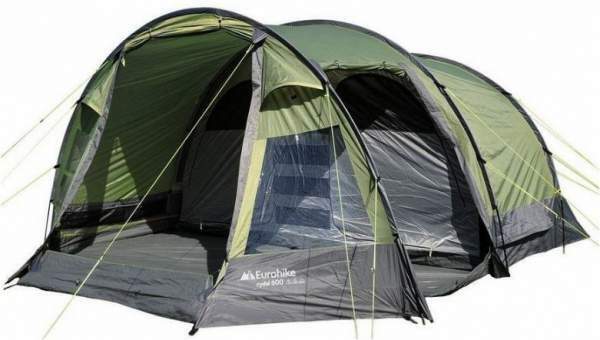 ♦ As for the remaining features, the tent is not freestanding and it offers 10 x 9 ft (3 x 2.7 m) area in the main room and 10 x 5 ft (3 x 1.5 m) in the screen room. The center height is 5 ft 8 in (173 cm). The total area is 140 ft² (13 m²). 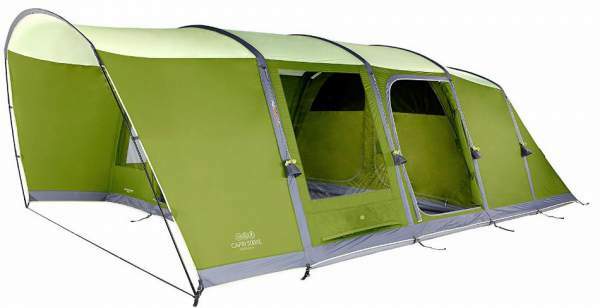 ♦ Note that they also have a smaller version with the same features, the Coleman Carlsbad 4-Person Dome Tent with Screen Room. ♦ As of the moment of writing this text, the Amazon price for this tent is $211. Please check the link for updates. Ozark Trail 10-Person Dark Rest Instant Cabin Tent. This is a 2-room tent, and it is with an instant setup, just like its smaller brother above. In spite of its dimensions, you can really set it up in under 2 minutes. All tents from this series are cabin type, and this is a typical example, with no less than 8 big windows and two external doors. So this is a nice family camping tent for summer vacations. The number 10 in the name describes it capacity but you should know that you have “only” 140 ft² (13 m²) of the floor area, so this may be far from enough for such a number of users. This is a freestanding tent, though as you probably know, this term is a bit meaningless. You will have to stake it down against winds. All necessary stakes are included in the package. You create 2 rooms with the divider which is available there, and both of them are the dark-room type. Please see more in my full review, just follow the link. 14′ x 10′ Ozark Trail 10-Person Half Dark Rest Cabin Family Camping Tent. Here you have a 2-room tent where one of them is a nicely designed screen room. This screen room is clearly behind the words ‘half dark’ which they use in the name. Obviously, when you use it as a screen room, you will set it up to have views around, so it will not be dark. But it can be closed completely because you have panels on the screen around, and the tent is also with the skylights design very similar to what you see in the other 10-person tent by Ozark Trail above. The screen room is fully floored, so you have a full bug and weather protection, and the capacity is the same as in the tent above, but you have extra comfort because of the screen area. The design includes the large front door which you see in the picture. Note that this is again an instant, cabin style, and freestanding tent, with the usual meaning of these words. This can be a really comfortable option for couples, or for parents with 1-2 small kids. The dimensions are 14 x 10 ft, so the floor area is the same as in the other 10-person tent above. The Amazon price at the moment of writing this text is around $196. 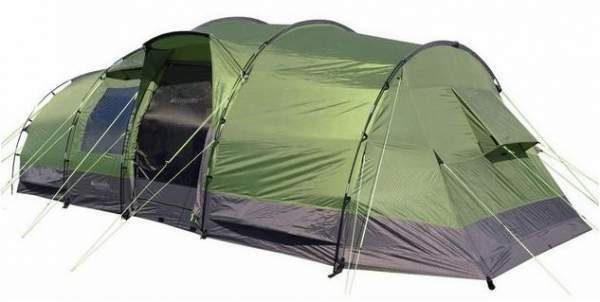 In spite of its modest declared capacity, which is 5 people only, this Rydal 500 tent has 3 separate rooms and it offers the floor area of 152.4 ft² (14.16 m²). So you realize, it offers more space than some of the 10-person tents which you have here in the list. The living area is very large and you have more than 6 square meters there, plus two sleeping rooms which are the dark rest type by the design. 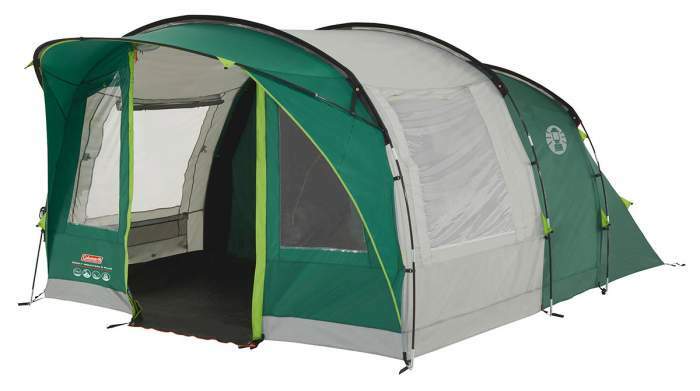 The tent has two entry doors and two inner doors, and it comes with solid PVC windows which you see in the picture. One of the doors allows for the awning configuration. The waterproof rating is quite good, so you have 2000 mm, and this is good enough for any weather conditions in a 3-season use. Please read more in my review. The Vango Woburn 500 is a 5-person tent built with an impressive waterproof rating of 4000 mm for the shell tent and 10000 mm for the floor. So this is a reliable option for family camping in any 3-season weather conditions. You will notice that it comes with PVC windows and there is no mesh in the ceiling, so the tent is very suitable for a cooler climate where you need the inner warmth preserved. The tent offers 160 ft² (14.9 m²) of the area organized in its 3 rooms, and these include a large living room with 3 windows and 2 large doors, plus a sleeping zone with 2 rooms built with the dark rest design. Please read more in my full review. 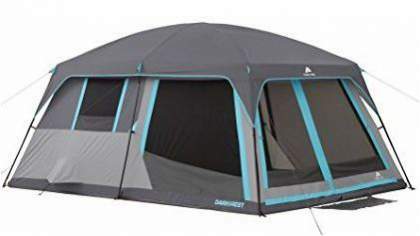 Vango Odyssey Air 500 Tent for 5 people. This tent, designed for 5 people, is in fact a 3-room design. So you have a large sitting room, plus a sleeping area with divider. The tent is with 3 air beams instead of classic poles. The inner tent which you can see in the picture is what they call “lights out” zone, with reduced glare and cooler. You have almost 15 square meters (160 square feet) of the floor area here, so this is a luxurious option for small families and for groups of friends. Note that the waterproof rating for this tent is impressive, with 4000 mm you are fully protected in any weather situation for a 3-season use. Vango Capri 500 XL Tent. Here you have an incredibly luxurious family camping tent which is formally for 5 people only, but it provides 172.2 ft² (16 m²) of the inner area, plus 34.4 ft² (3.2 m²) under the front porch. This implies 34.4 ft² (3.2 m²) of the inner area per person. The dent is with 4 air beams and one classic fiberglass front pole. You have a 3-room design here, one large living area plus 2 smaller sleeping units. The tent is fully closed, so you do not have mesh here, and the windows are solid PVC material. So the design is very much suitable for a cooler environment. The waterproof rating is impressive 4000 mm, so the tent is for any weather situation in a 3-season use. This tent has an external shell tent with 3000 mm waterproof rating, and inside you have two separate tents within the shell, located on the two sides, see the picture above. These inner tents are a breathable polyester material and it is dark on purpose to reduce glare. 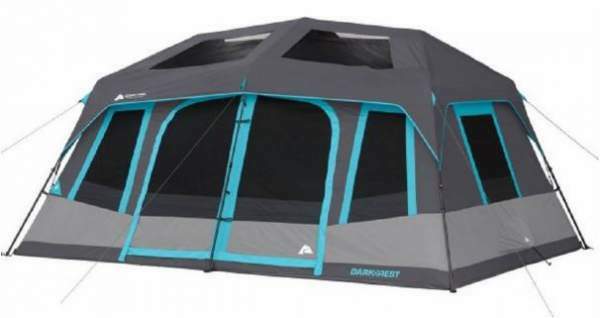 But this tent is less dark than some other models which you have here in the list, so I would call it “darkish”. The manufacturer call it a dark rest design, and this is why it is included here. However, this is an incredibly luxurious family camping tent. You have 3 rooms here; one is a large living room in the middle, plus two sleeping rooms with place for 3 people each. So the capacity is 6 people, but note that the total area is 181 ft² (16.8 m²). The windows are all PVC material and equipped with blinds to reduce glare and for privacy. There are many storage elements in all three rooms, you have electric cable port and Velcro tabs to pass the cable to the ceiling. You have no less than 8 vents here, and there are two entry doors, both equipped with mesh and panels. One is designed for an awning, so you raise its flap and create the awning with the help of two extra poles which you have in the package. Please see more in my full review. The Rydal 600 is a 6-person tent by the declared capacity, but it offers 181 ft² (16.8 m²) of the floor area in its 3 rooms. 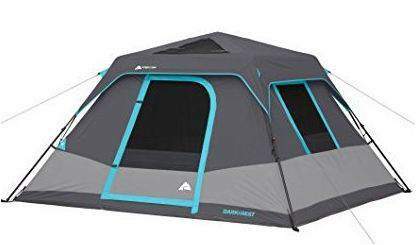 The tent is with great features yet this is a budget-friendly option for family camping; as of the moment of writing these lines, its price is only $186. But see its size and its great features. The tent is in the group of dark rest tents because of its sleeping area which is a tent within the external shell tent. The materials are dark and glare is considerably reduced. The windows are with PVC panels, and they are also equipped with blinds from inside. There are many nice organizational features inside, and those include some 18 storage pockets, an electric cable port, two huge entry doors and two inner doors, and no less than 5 vents. The floor is fully sewn-in and the inner tent is also with its extra bathtub floor. The waterproof rating for this tent is 2000 mm and this is good enough for a normal 3-season use. Please read more in my detailed review. Vango Odyssey Air 600 Tent. Here you have a tent without metal poles. Instead, you have 3 air beams and a pump included in the package, and with this, you raise the tent from the ground in some 8 minutes or so. The tent is here in the list because of the design which the manufacturer calls “lights out”. In other words, the glare is reduced due to a tent within the tent which you have here. The structure includes a large sitting room plus the sleeping area which has a divider, so effectively you have a 3-room tent here with the total floor area of 190 ft² (17.67 m²). The waterproofness rating for this tent is 4000 mm and it is suitable for any weather conditions in a 3-season use. Please see more in my detailed review. The declared capacity of this tent is only 6 people but this huge tent offers the total covered area of 230 ft² (21.4 m²), and the inner area is 192 ft² (17.8 m²). So you have extra porch as you see in the picture. The tent is with 3 separate rooms, a large living area plus 2 sleeping units which are a tent within the tent. The inner materials are made darker on purpose and this is what qualifies it to be included here in the group of dark rest tent. You have 2 external doors and 2 inner doors, 5 solid PVC windows, and many pockets for storage of smaller items. The waterproof rating is great, 3000 mm, so this tent will provide all protection you need in any weather conditions in a 3-season use. Please read more in my full review. Vango MARNA 600 XL Tent. When you see all these PVC windows (and it has them 11 in total) you would not expect that the Marna 600 XL is a dark rest tent. But indeed it has an inner sleeping area which is a tent within the tent and it is with what they call the lights out design. Note also that all those large windows are equipped with zippered shatters from inside so you can reduce the daylight even in the living area. The tent offers 192 ft² (17.8 m²) of the inner floor area, and you also have a porch so the total protected area is 267.3 ft² (24.8 m²). The inner area is a 4-room structure and this is why I have included it in my list of 4-room tents. But the porch is fully enclosed and with 6 PVC windows, although floor-less, so it looks like an extra room. The waterproof rating is impressive and you have 4000 mm for the shell tent and much more for the floor. Please follow the link to read more in my full review. 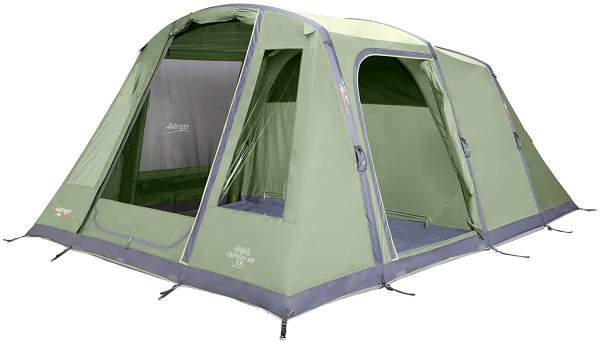 Vango Capri 600XL tent with air beam technology. 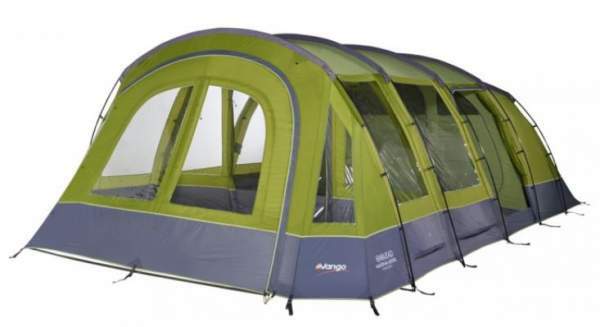 This tent is with an Air Beam technology, similar to the other Vango tent above. Instead of the usual poles, you have air beams for tent’s support. Though the front pole on the porch is metal. This is a 3-room design for 6 people but it offers 3 square meters per person. This means you have 194 ft² (18 m²) of the floor area, so this is a very luxurious design. Only the sleeping area with two sleeping rooms is a sort of dark area, and they use the term ‘lights out’ for this design. The tent is with an impressive waterproof rating, so this is a very reliable 3-season camping tool for areas with lots of rain. Vango Odyssey Air 800 Tent with the ‘lights out’ design. This beautifully designed structure is an inflatable tent with 5 separate rooms. So you have a huge central living area and on the two sides you have two sleeping zones. Now, each of these is separated by a removable divider so you have 4 sleeping rooms. The total area is 200 ft² (18.59 m²). The waterproof rating is the same as in the other Vango tents, which means that you have 4000 mm and this is more than enough for any 3-season use. Note that the floor in the living area is not sewn-in, but it is linked-in instead, so it is removable for an easier cleaning. The sleeping rooms are fully sealed from the round and with a bathtub floor. The windows are PVC material. Ozark Trail 20 x 10 Dark Rest Instant Cabin Tent. 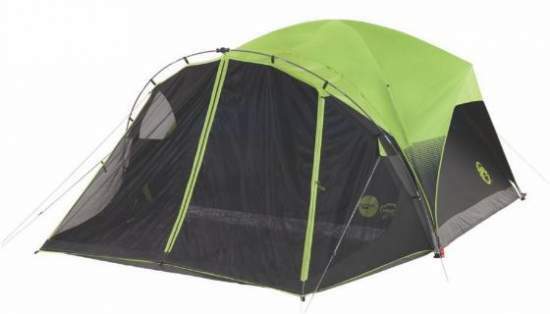 This tent offers the same features as the other Ozark Trail tents given above in the list. But this is a larger rectangular structure with 3 rooms and two doors on the opposite sides. Its dimensions are huge, so you have 200 square feet (18.6 m²) of the floor area. But the declared capacity of 12 people makes no much sense so if you use it for 6 or 7 people you will have a great summer camping tool. As you realize from the picture, you have several skylights here and you regulate the amount of light in the tent with the inner panels under the ceiling mesh. This is a very pleasant construction, and the price tag is more than reasonable. Please read more in my detailed review. Vango IRIS 600 XL Tent. This tent is here because of its lights-out design as the manufacturer calls it. So this is the same principle used in many tents by Vango – you have the sleeping area which is a tent within the tent, and its material is dark so the daylight is reduced. This is an impressive tent with its 226 ft² (21 m²) of the floor area organized in 3 units that include a huge living room and two sleeping rooms. The declared capacity is 6 people but there is enough area to accommodate twice as many users. The tent is with 2 entry doors and 7 solid PVC windows. This is a reliable tent for a 3-season use, you realize this from its 4000 mm waterproof rating and its fully sewn-in waterproof polyethylene floor. Please read more in my full review. 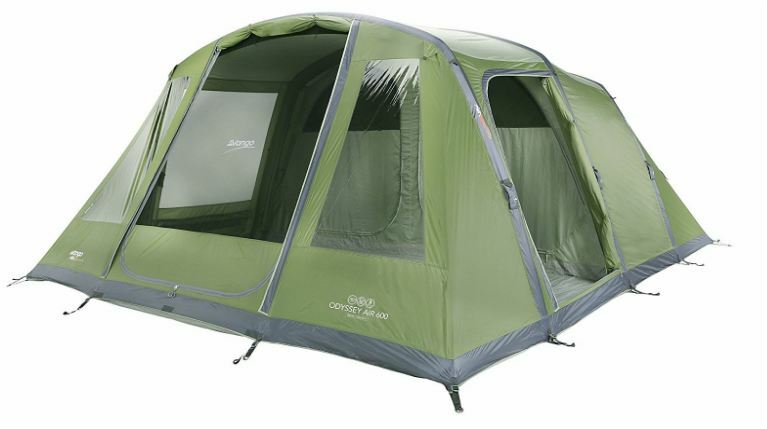 Vango Stanford 800 XL Tent. Here you have an impressive tent in many ways. The declared capacity is only 8 people but the total floor area is 227 ft² (21.1 m²), which makes 28.4 ft² (2.6 m²) per person. So this is a luxurious option for camping. The tent is with 5 rooms, so you have 4 sleeping units plus a large living room. The Stanford 800 XL is here in the list because of its dark rest design, so this implies two tents within the external shell tent and those are built from a darker material to reduce glare. The waterproof rating is 4000 mm so the tent will protect you in any weather conditions in a 3-season use. Note that you also have solid PVC windows and the floor is fully sewn-in and sealed. Please read more in my full review. The picture above shows the 6-person XL size of this tent, but you have also a 4-person tent, 6-person tent, and 6-person L. What you see is a 4-room structure with blackout bedrooms that block out 99% of the sunlight. Note that this design has received The 2016 Camping Magazine Editor’s Choice Awards in The Category Best Camping Innovation. The shell tent is with 4500 mm hydrostatic head so you have a full protection. All seams are taped and the floor is fully waterproof with inverted seams. The inner floor area is 230 ft² (21.44 m²). The tent is with a hinged door. This is yet another thermally insulated tent here in the list, you have seen its smaller cousin the Crua Tri tent above. This Crua Loj 6 is formally declared for 6 people, but they haven’t used the backpacking principle in determining the capacity of this tent. So the area which you have here is far larger than in many 12-person tents described here within the site. Indeed, you have total covered space of 300 ft² (28 m²) with the porch included. The inner tent area is 235 ft² (22 m²), so imagine how luxurious this can be for 6 people. The tent is 3-room type plus the porch with vestibule and awning, and the tents sleeping rooms are thermally insulated and with the R-value 4. But related to this text about the dark room tents, you have the inner cocoon with a thick insulation which makes the sleeping zone completely dark, and this is the reason for having this impressive tent in this list. 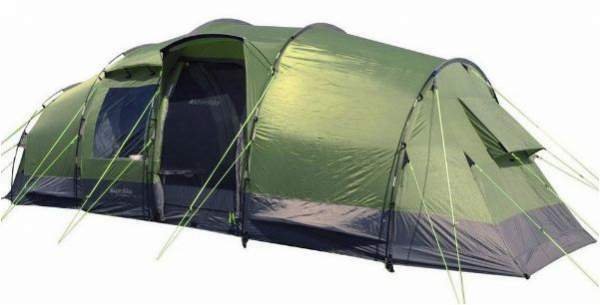 The tent is described in detail in my separate review, so please check the link below, you will be impressed with its all features. This tent is so low in the list because of its huge inner area which is 249 ft² (23.1 m²), and when you realize that this all is for 8 people only, you understand that this is a very luxurious camping option. You have no less than 5 rooms; these include 4 sleeping rooms plus a large living area. Now, the tent is here in the list because of its dark rest design which you have in those sleeping units. 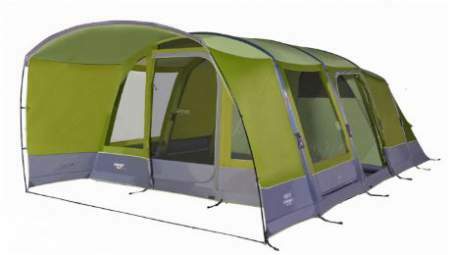 The tent is equipped with two doors that are double-layer type so you have a mesh as well. One of them allows for an awning configuration, and you have extra poles included for this purpose. There are two PVC windows, and the waterproof rating is impressive 3000 mm. With its sewn in and sealed floor and all seams taped, this is a reliable family camping tent for a 3-season use. Please read more in my full review. Outwell Corvette 7 Air Comfort Family Tent. This camping castle has 5 separate units which include 3 sleeping rooms, one huge living area, and one huge fully closed vestibule area. The sleeping zone is a double layer structure, a tent within the tent and this is the true dark rest design, so glare in the sleeping zone is considerably reduced. In addition to this, the large PVC windows in the living area which you see in the picture are tinted and equipped with toggle-up curtains for privacy and glare reduction. The groundsheet is a sealed double-coated 100% polyethylene with 10000 mm hydrostatic head, and the tent’s body is Outwell’s Outtex fabric with 5000 mm hydrostatic head. This huge structure is supported by 5 air beams instead of classic poles. So this was my list of the best Dark Rest tents for camping. It will be extended in the future as new great models appear on the market, so keep an eye on this text and have it bookmarked. The differences in the prices of the tent in the list are drastic. The most expensive is the Crua Loj 6 tent, but this is with all good reasons. In any case, it makes sense checking all these models carefully before you decide. Thank you for reading. If you did not find what you need, please check around, this site is all about family camping tents. In the case of questions or comments, please use the comment box below. If you know a dark room tent which I haven’t include let me know. Have a nice day. I miss the Eureka Spring Creek tent. Eureka has more length in the sleeping area. Hi Inge, I agree with you this is a great tent. But it is discontinued by the brand as far as I know, so it is still available at some sellers in EU, but not globally on Amazon. It would be nice if you featured tents that were still available. Every one I try to find is no longer being sold/made. Certainly not in Canada. Very frustrating. A price idea or actual places to purchase these tents would be great. Hi Terri, sorry for such a bad experience. Here is what happens: Amazon uses geo-location so it redirects visitors to their local Amazon stores, in your case this is Canada. Now, in some stores these items are obviously missing, I know this because I am also redirected to Amazon in France and can tell you the items are missing most of the time. I could disable this redirect and visitors would only see the US store items, but the advise is to keep it as a better option because people can still have a chance to order locally and to pay less for shipping. But I assure you that I only put items that are really available in the main Amazon store and this is the US. So everything you have here in the site is available right now. The prices are always accessible in every link (but this may not be displayed if the item is missing in your Amazon store of course), but I also always give the price separately (in USD); there is a separate subheading The price & rating, check in the posts and you will see it.